We will be open on Valentine's Night! Reservations and Prix Fixe Menu only (except for children). Please call 714-377-3928 for a reservation ASAP since it was completely packed last year. 100% organic spicy miso ramen is ready to be served! Because it takes a lot of time to prep this special ramen, there will be a limit of 5 servings each lunch time and dinner time. 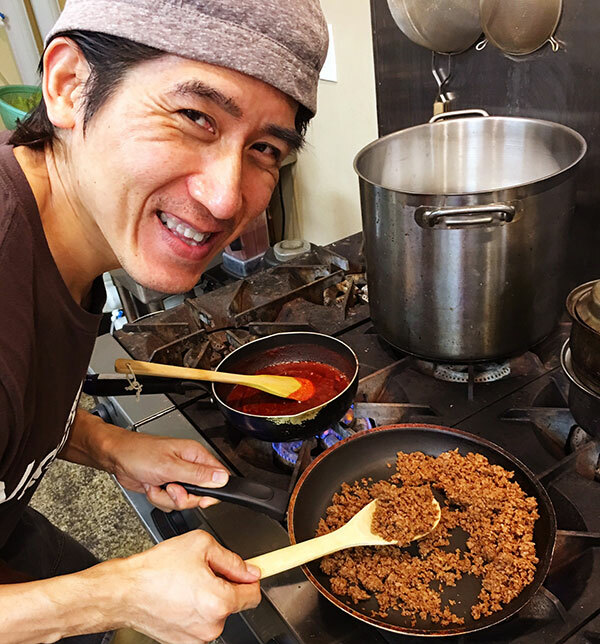 In our last newsletter we have told that the owner/chef Akira was struggling to make his Spicy Miso Ramen, which had been super popular as the special of the week, fully organic. Although he solved the most issues, the last one was very hard. 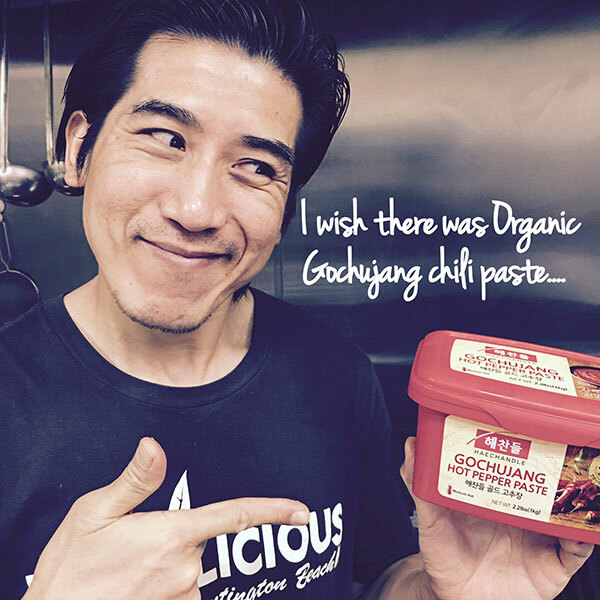 He needed Gochujang chili paste, but there was no organic Gochujang chili paste anywhere. 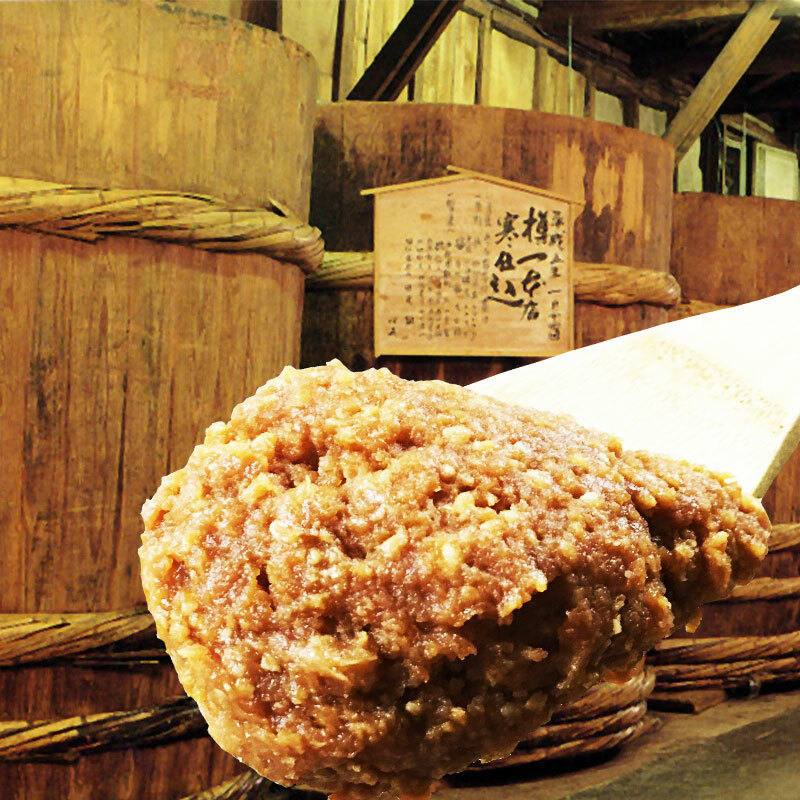 He has been working on making the paste from scratch, and it is finally near completion. The paste he has made tastes a lot nicer & richer than any commercial ones and it is absolutely 100% organic!! The enticing finished ramen soup consists of organic vegetable broth, Akira's handmade Gochujang chili paste and the best organic miso from Japan. Akira is now making final adjustments. 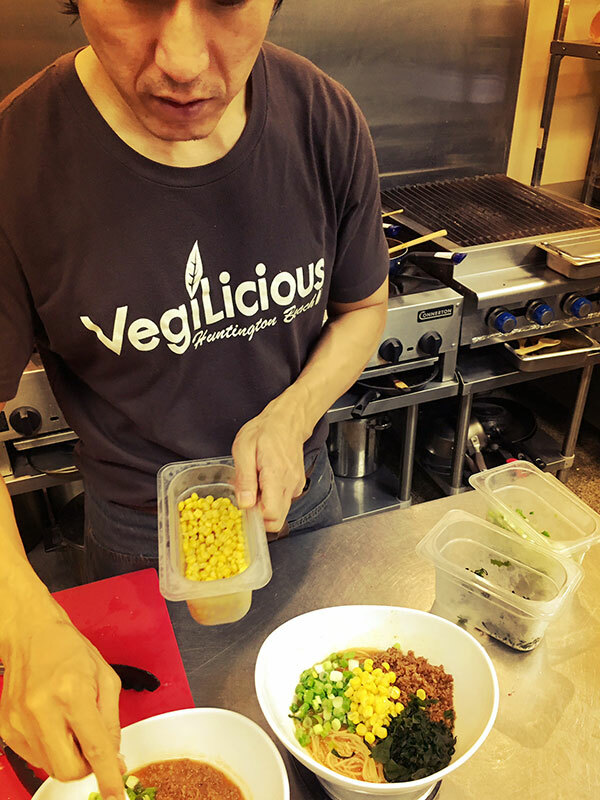 In the next newsletter, we are going to announce the release date of our all organic vegan ramen at VegiLicious. In our last newsletter we have announced that we will put "Spicy Miso Ramen Noodle & Soup w/ seasoned meatless minced meat & vegetables" on our regular menu listening to many customers' requests. 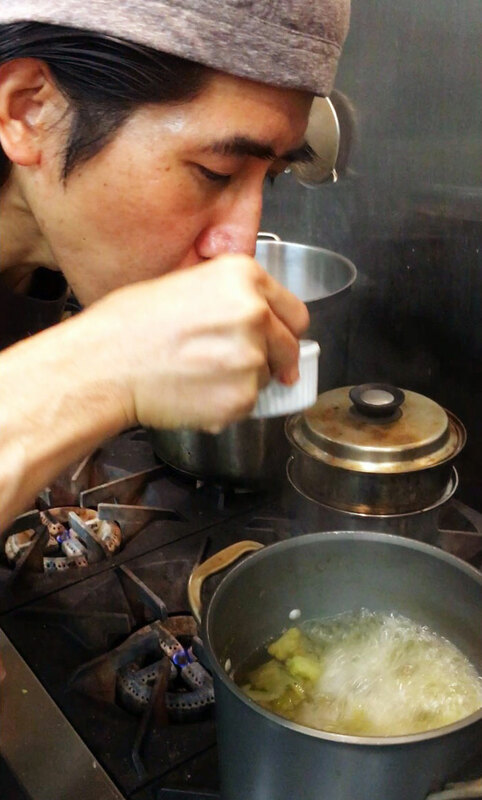 The owner/chef Akira wants to make all the ramen ingredients 100% organic at this opportunity. The noodles are already organic, and the seasoned meatless minced meat has almost been complete. It is ORGANIC and GLUTEN-FREE!! Akira has made it happen so people who needs to eat gluten free can enjoy the whole ramen when he invents gluten-free ramen-noodle in future. 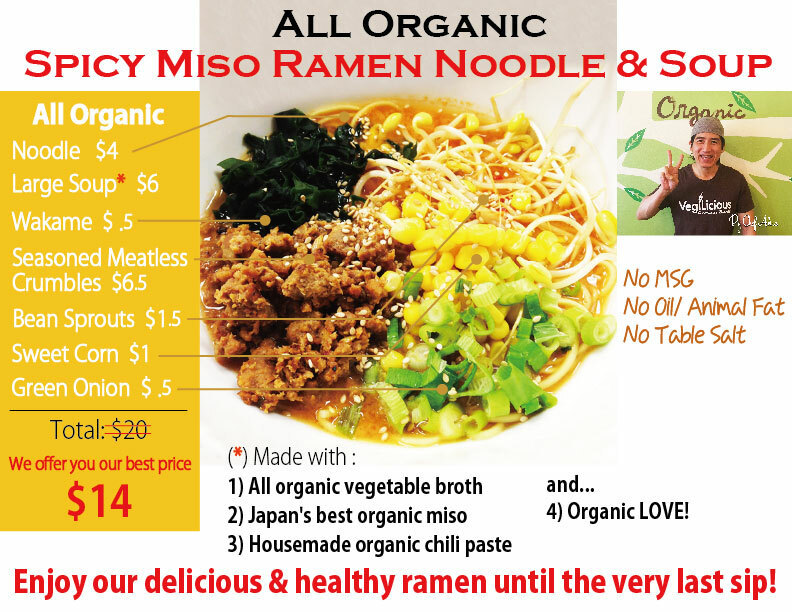 He is trying really hard making everything 100% organic to provide the highest-graded and great-tasting ramen. Give him a little more time. We will let you know if we can really provide our ideal ramen for you on the next post. The Special Spicy Miso Ramen will be on our regular menu soon!